Last Friday, I visited Mauricio Hair Studio Privato for a conditioning treatment, haircut and blow out. The three-chair salon is located at 210 Fifth Avenue, Suite 1102, between 25th and 26th Streets. The Flatiron studio opened a year ago, and also offers nail services and makeup application. The salon uses 100% all-natural organic hair care including products from Intelligent Nutrients PureLuxe, Harmonic and Certified Organic collections and rahua. The atmosphere is intimate and zen-like and the experience feels really personalized since all the attention is on you. There are no distractions, no stress - just time to relax and get your hair cut and styled without feeling rushed. 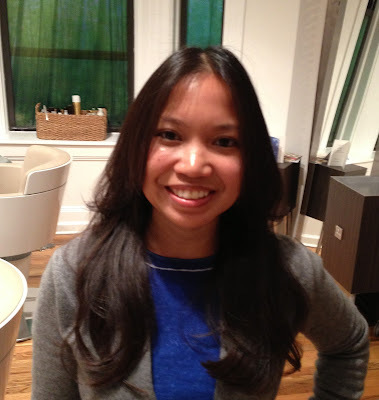 Wendy shampooed my hair with Intelligent Ingredients PureLuxe harmonic shampoo, which had a minty aromatherapy scent. Even hours later my hair still smelled and felt minty fresh. I think I'm hooked on this shampoo! rahua conditioner was used on my hair as a leave-in, deep conditioning treatment for 15 minutes under the dryer. Mauricio gave me a fabulous cut and style, adding in some layers for volume and shape. Mauricio Cifuentes has been a fashion and editorial hairstylist for over 10 years and has successfully created Mauricio Hair Studio Privato as an alternative to your everyday, commercial salon. Mauricio also makes jewelry in his spare time and sells the gorgeous pieces at his studio, sourcing emeralds from Colombia, and other stones from South America and Asia. Learn more about the salon and services at mauriciohair.com.